“…Mr. Towle wanted to go in but did not get away until last January. He went to Skagway and in February sent for his wife. They then started over the pass for Lake Bennet, where they opened a log cabin hotel, and were doing well financially, until early in the morning of March 24th, Mr. Towle was suddenly taken very sick with puenmonia, and in less than an hour was delirous, never again wholly recoving consciouness. 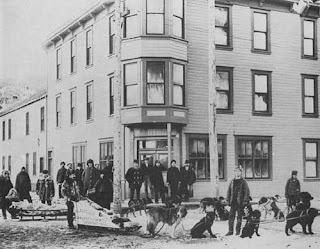 The folling Sunday morning Mrs. Towle secured a sled and dog team, and with the assistance of one man, started with her husband for medical aid at Skagway. She walked bside the sled, watching over him and keeping his face and hands from freezing, while passing through the fearful cold part of the journey at the summit. They arrived in Skagway at nine o’clock at night and Mr. Towle was placed in the hospital. During the entire trip from morning till night walking thirty-seven miles, Mrs. Towle did not take a particle of nourishment, and this with her anxiety for her husband and the fathigue of the long hard climb, was too much for her, and after she had secured his comfort, she completely collapsed, and was herself prostrate until after arriving in Snohomish. The Snohomish boys at Skagway immediately came to her service, and everything possible was done for Mr. Towle, but on the following Thursday he succumbed to the disease. Happy Birthday to Capt. Moore born on this day, March 30, 1822 in Emden, Hanover, Germany. He came up here from Vancouver in 1862 as an explorer. He and his wife, Hendrika Fenn had several kids and grandkids who lived here prior to the gold rush. 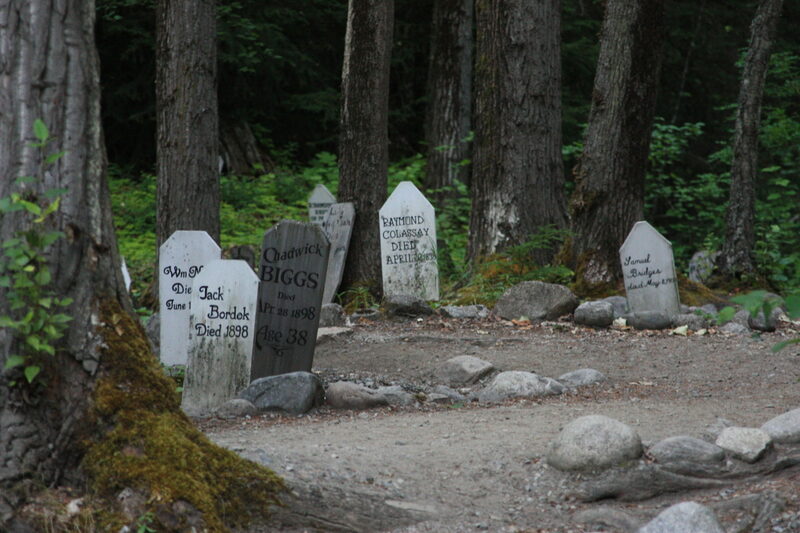 He once owned much of the land that is now Skagway, but was over run by goldrushers in 1897-1898. His original cabin and house is now owned and has been renovated by the National Park Service. When Capt. Moore left Skagway, he and his family moved back to their lovely home in Victoria. In November I walked the road where the house once stood, but unfortunately has been replaced by condos. There are a few renovated Victorian Houses on that street. He and Hendrika are buried in the Ross Bay Cemetery, a two mile walk from downtown Victoria. Try as we might, even with the exact plot number, we could not find the actual graves, but I’m sure they are there. Kate Mason also known as Nadagaat Tlaa Kaachgaawaa, married George Washington Carmack around 1889, or so she thought. After finding the gold in the Klondike and starting the whole Gold Rush thing, they became very wealthy and moved to Hollister California. Being away from home was not good for Kate or her daughter Gracie, as George left them and married someone else. Long sad story there, written up many places. Kate returned home and on this day, March 29, 1920 she succumbed to the flu in Carcross and is buried in the little Carcross Cemetery. 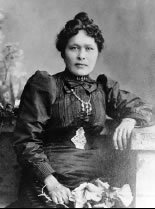 She was variously reported to have been born in either 1857, 1862 or 1869 in Tagish, perhaps. Mr. Young was an integral part of the Skagway community at the turn of the century. He was born on August 15, 1853 to a large family in St. David Parish, Charlotte County, New Brunswick, Canada. He was assistant to Erastus Corning Hawkins, the White Pass Chief Engineer. Young was also the proprietor of the 5th Avenue Hotel by 1904 (see above photo) and the chief agent for the Great Northern Railroad in Washington. Young died on this day, March 26, 1905 of pneumonia in Dawson, Yukon. His wife, Emma had died 3 days earlier in Dawson. They left behind a daughter, Edna. Mary died on this day, March 25, 1919. There is absolutely no information other than her name and date of death on the death certificate, so I will try to view the newspaper records for additional info. During the spring of 1919 the influenza hit Skagway and took down quite a number of people. We are still “flued up.” The hospital filled up and they had to open what was formerly The White Pass Rooming House. They could get no one to cook & keep house so I volunteered to do it. I came here yesterday and had to order food – dishes etc. I think they are scared & feared the worst. So far I have 2 of the teachers – all others are at the Hospital. I am fine – I hope I had it when I was sick a month ago but I am not sure. I never was better in my life. On this day, March 24, 1894 there was an infamous murder in Dyea. This murder involved Scum Doo or Scundoo, a native medicine man/witch doctor (known to be a medicine man because he was born with a double crown and had red hair). 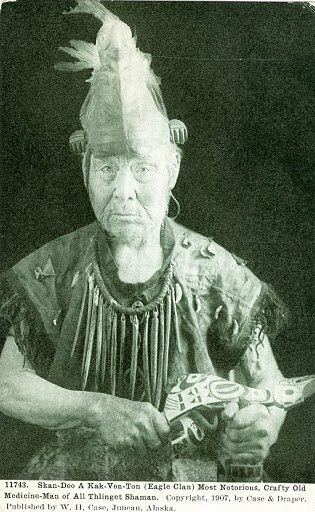 “In July, 1894, Skun-doo was arrested for causing the death of an Indian woman, Ches Oqhk, while practicing shamanism. A death had occurred in the village, and the relatives of the deceased employed his services, at a fee of 20 blankets, to determine the cause of death. As a result of his divinations, Skondoo settled on Ches Oqhk, suspected of being a witch, as the cause of death. Under his direction, the deceased’s family bound the woman for 10 days, and she died from lack of food and water. Scundoo was sent to San Quentin for some years. He returned home and was photographed in 1907 by W.H. Case, see photo above. 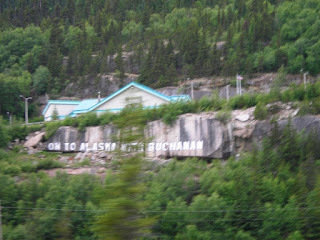 On To Alaska with Buchanan! 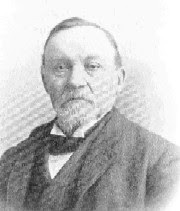 George Buchanan was a successful businessman, a coal merchant in Detroit. During the Depression he decided to help boys to get out of town and see Alaska. Every summer from 1923 through the Depression, Mr. Buchanan and 50 or 60 boys journeyed across Canada to Vancouver, sailed up the coast to Skagway, spent several weeks touring Alaska, climbing glaciers, panning for gold. Part of the deal was that their parents would donate 1/3 of the money ($81), George would donate 1/3 of the money and the boy would work selling items such as kitchen implements door to door to raise the remaining 1/3. In the White Pass depot building there is a glass display which has one such kitchen gadget that was sold as part of the fund-raising. On the rocks below the U.S. Customs Station at Clifton are the words “On to Alaska with Buchanan” which was their motto. In 1935, he agreed to take girls, the sisters of the boys who had gone, but he made them earn money by baking pies and darning socks also. George was born in Thamesville, Ontario on January 29, 1869 and died on this day, March 23, 1939 in Stuart, Florida at the age of 70. He is buried in the Woodlawn Cemetery in Detroit. Not a good day to be at the top of the Chilkoot Pass. 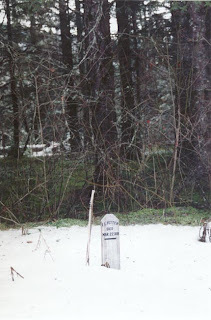 Mr. Fetter died there on this day, March 22, 1898 and was buried in Dyea. He was born in Oregon and was only 36 when he died. His brother Vernor died two weeks later in the big avalanche of April 4, 1898. He too is buried in the little Dyea cemetery. Sgt. Major James Kelley married his sweetheart at the beginning of March 1898 in Vancouver Washington. He shipped out one week later and arrived in Dyea in March 1898. He was in charge of the 14th Infantry and as they were setting up the camp, he suddenly cried out in pain. He was struck with spinal meningitis and died on this day, March 19, 1898. His body was shipped back to Vancouver Washington and a large stone marker sits on his grave in the military cemetery there. 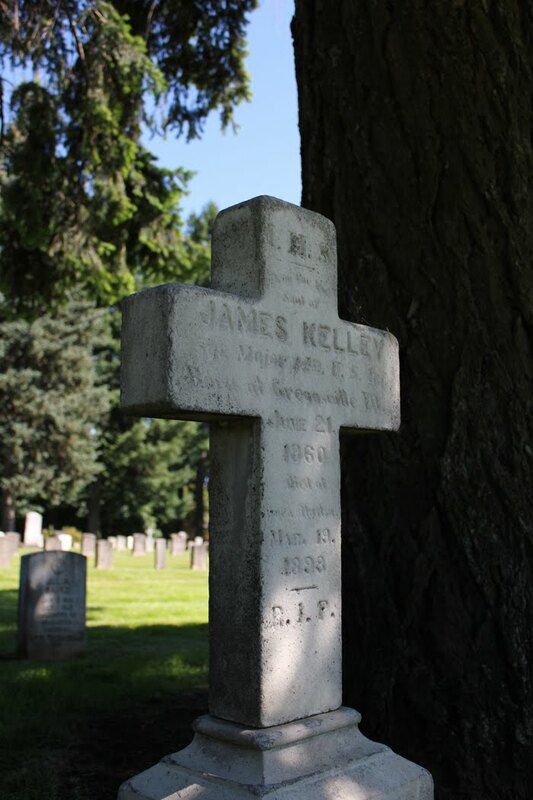 Oddly, cemetery records show a dependent, an infant named James Kelley also buried in the same plot in March 1898. Although this could be a mistake, it paints an odd picture. Sgt Kelley was born in Greggsville, Illinois on June 21, 1860 and was 38 when he died. 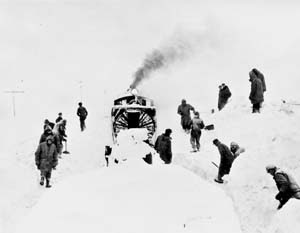 Another death due to a White Pass accident, this on March 18, 1918. Ed Barry had survived the 1917 accident that killed the McKenzies, but on this day, the rotary engine rolled at milepost 106 and killed him. Ed was born on August 18, 1880 in California and had come to Skagway in 1899 from Tacoma to be a painter and later a WP&YR engineer.